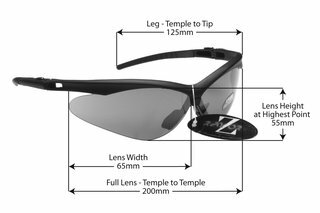 Home All RayZor Sunglasses Rimless Sunglasses WINDSHIELDZ: RAYZOR BLACK FRAMED SPORTS SUNGLASSES WITH A BLUE IRIDIUM MIRRORED ANTI GLARE LENS. WINDSHIELDZ: RAYZOR BLACK FRAMED SPORTS SUNGLASSES WITH A BLUE IRIDIUM MIRRORED ANTI GLARE LENS. Lightweight Matt Black Frames Manufactured from a Shatterproof Polycarbonate Compound, With Black Rubber Head Grips and Black Rubber Nose Pads. They are comfy and stylish. They look cool and I have had a handful of people compliment them. They stay to the head well and everything. I love them. WINDSHIELDZ: RAYZOR DARK RED FRAMED SPORTS SUNGLASSES WITH A RED IRIDIUM MIRRORED ANTI GLARE LENS. RAYZOR VYZORS: BLACK FRAMED SPORTS SUNGLASSES WITH A 1 PIECE SMOKED BLUE LENS.